UV curing utilizes UV light or visible light to start a photo-chemical reaction process that generates a cross-linked network of polymers. It easily adapts to stereo lithography, decorating, coating, printing, as well as the assembling of a variety of materials and products. UV cured printing ink is a radiation-curing ink type that dries upon the treatment of UV light. It is made in such a manner that it replaces heat-set ink, solvents of which emit toxic gaseous emissions. However, owing to the high cost of UV cured inks, they are used only in specialty printing, which include flexography, metal decoration, screen printing, cosmetic packaging, and liquor cartons. The market for UV cured printing inks is primarily driven by less VOC emissions in UV cured printing and continued expansion in the packaging industry. Since the middle of the 19th century, UV inks have been used in various operations of the printing industry. Recently, the popularity of UV cured printing inks in the printing industry has increased significantly. Three areas of environmental issues require to be addressed for the manufacture of UV cured printing inks: air pollution emission, waste disposal, recyclability of UV cured printing inks. UV cured printing inks usually have no significant volatile organic compounds (VOCs) and hazardous air pollutants (HAPs). Moreover, most of the monomers, oligomers, and photo initiators used in UV cured printing inks are not classified as hazardous. Furthermore, UV cured printed products can be recycled into lower grades of paper if a washing process is used in the recycling process. If a floatation process is used to recycle paper, then UV printed products can be ‘upcycled’ to higher grades of paper more easily. Since, UV systems emit virtually no hazardous air pollutants and only very small amounts of volatile organic compounds, they require no additional air pollution control equipment and are considered environmentally friendly. This offers high expansion opportunities for the market during the forecast period. However, availability of substitutes such as water-based inks, EB, etc. is anticipated to hinder the expansion of the UV cured printing inks market. Demand for radiation curing has increased significantly in the last few years. This can be ascribed to the numerous technological advancements in the field of radiation curing. In 2017, a majority of cured inks were produced by the UV drying process using a mercury vapor quartz lamps. However, owing to many drawbacks regarding health and environmental hazards at the end-of-life of mercury arc curing, new technologies are being sought. One such technology is electron beam (EB) curing. Developments are being made to expand its usage through lower-cost and smaller EB curing units. Moreover, much progress has been made in the last few years for the application of EB curing in sheet-fed processes and also broadening the ink technology so that it can be used effectively on flexo and gravure presses. As such, a shift in trend, however slight, has been observed toward the application of EB cured printing inks from UV cure printing inks, especially in the North American market. 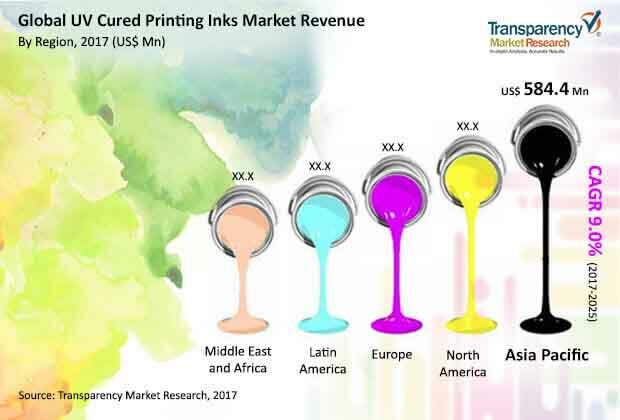 The changing preference toward EB cured printing inks is anticipated to hamper the expansion of the UV cured printing inks market, unless alternative UV curing technologies are developed that help overcome the drawbacks of UV curing. The UV cured printing inks market can be segmented into type, ink type, application, end-user, and region. Based on type, the UV cured printing inks market can be segregated into arc curing and LED curing. In terms of revenue, the arc curing segment constituted more than 60% market share in 2017. In terms of ink type, the UV cured printing inks market can be classified into free radical and cationic. In terms of revenue, the free radical segment constituted more than 80% market share in 2017. Based on application, the UV cured printing inks market can be divided into flexographic, gravure printing, offset printing, digital printing, and screen printing. In terms of revenue, the offset printing segment constituted more than 40% market share in 2017. In terms of end-user, the UV cured printing inks market can be categorized into publication & commercial printing, packaging, and others. In terms of of revenue, the packaging end-user segment constituted more than 50% market share in 2017. Based on region, the UV cured printing inks market can be classified into North America, Europe, Asia Pacific, Middle East & Africa, and Latin America. In 2017, Asia Pacific dominated the UV cured printing inks market with more than 30% share and is expected to follow the same trend during the forecast period. Key players in the UV cured printing inks market are expected to benefit by forming of strategic alliances with raw material suppliers, as a shortage in supply of raw material can disrupt production. Major market players in the UV cured printing inks market are DIC Corporation, Toyo Ink Co., Ltd., T&K TOKA CO., LTD., Flint Group, INX International Ink Co. (Subsidiary of Sakata INX), FUJIFILM Holdings America Corporation, Siegwerk Druckfarben AG & Co. KGaA, ACTEGA GmbH, SICPA HOLDING SA, Wikoff Color Corporation, Marabu GmbH & Co. KG, Nazdar, Tokyo Printing Ink Mfg Co., Ltd., HuberGroup and others.